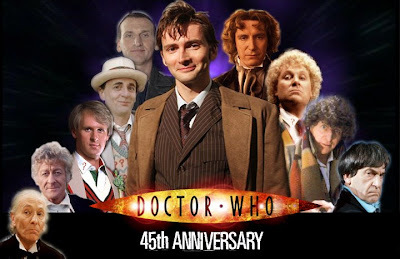 Last Sunday was the 45th anniversary of Doctor Who. It’s hard to believe that Doctor Who has been around for so long. 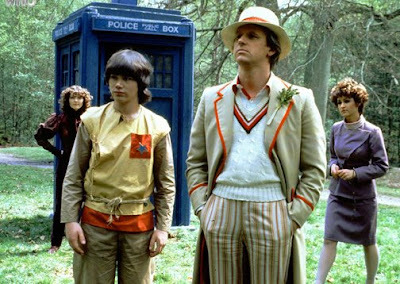 When I started to watch it Peter Davison was the Doctor and once I got into the series, I was mesmerized. I was/am fascinated by virtually everything about the series. If I may indulge in how I became a fan of this series, it goes all the way back to 1984. I knew of Doctor Who for much of my life but I was a Star Wars fan. I saw Star Wars in theaters in 1977 at the very young age of 3. My parents brought me to see it. Obviously, visually it was astounding. It was fast paced and everything was perfect for am impressionable you to watch. It made me think anything was possible. The ideas behind the story was vast and on a massive scale. That was my benchmark in watching anything that was remotely labeled as science fiction. Doctor Who was shown on our PBS station KTCA in the early 80s running the Tom Baker episodes on a Mon-Fri schedule. I think at 5:30pm every night. I say I think because I never watched it. I know the bully at my school watched it as he would mention it while he was pushing me to the ground. That might be another reason why I never watched it. That and also because when I turned it on one day I caught a glimpse of it and it looked extremely cheap and did not hold my interest. It just made me turn the channel. Jump forward a couple of years and on one Friday August night, (September I would enter the fifth grade) I am at home and my Mom calls me into the kitchen where she was watching TV. I started to watch this really fun program with her. The show already started but it was a science fiction/fantasy affair that was based in seventeenth century London. It caught my Mom’s attention because she thought the costumes were colorful and somehow appealed to her. Amongst all of these strange characters, there was a colorful android which would dress in a black robe and where a skull mask and there was another guy who wore a beige/cream colored outfit with a coat that had red piping and for some reason (which I really still do not buy to this day) wore what looked like celery on his lapel. Obviously, I am talking about Doctor Who. The story was The Visitation. At this point in the broadcast history of KTCA showing the series, Doctor Who moved on from daily broadcasts to once a week now as a movie version broadcast. While watching the story, I thought to myself this must be Doctor Who even though I didn’t really know what Doctor Who was. Somehow I just sensed this even though I hardly ever seen it. I knew the character Doctor Who that wore a long scarf and had floppy curly hair but I didn’t know about this new different guy. So, when my suspicions were confirmed that I was watching Doctor Who, I just assumed that it meant that there were two actors who had played Doctor Who at this point. Good old KTCA soon set me straight. Goodness me there are five of them now! About a month after I started to watch Doctor Who on a regular basis, KTCA broadcast The Five Doctors. From what little I cobbled together of the series based on the few episodes I had seen up to this point had been completed blown out of the water. It was a complete shock that there were five Doctors and that they were all meant to be the same character. Also, it was a massive surprise to me to learn the series had been running for twenty years! 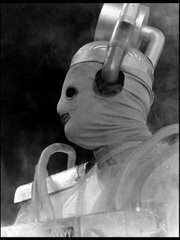 I greatly enjoyed the story but the one thing that grabbed my interest more than any treacherous Time Lords, Raston Robots, or Mind Probes was the opening sequence with William Hartnell. 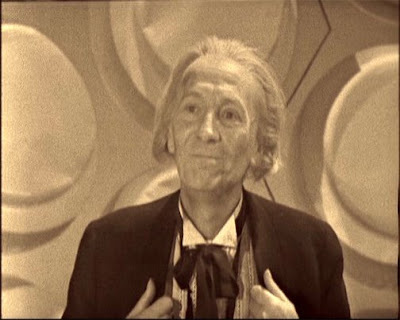 I knew the series was old but it came as quite a shock to see that short sequence when everything else I had ever seen of Doctor Who was of a younger man playing the title role as well as stories shown in color. It was like this distant message that broke through from some other dimension. It was magical. When The Five Doctors started with that short excerpt from Flashpoint, it’s like I knew I was going to be a fan for a long time and I wanted to see as much of the series as I possibly could. Over the years I met many fans. I been to many conventions, worked on many conventions and even ran a couple. I ran fan clubs, viewing societies, and panels. I met and personally know actors and actresses who have appeared in Doctor Who. Friends of mine who were fans have gone through phases where they stopped watching for a while and eventually came back. I never stopped watching. I enjoy Doctor Who as much now as I did when I saw The Visitation all those years ago. I did my own personal celebration Sunday November 23rd watching the documentary Doctor Who: Origins, An Unearthly Child, and Journey’s End. It was a very enjoyable evening. This week is Thanksgiving and as I have Friday off, I will be spending the day watching more Doctor Who. To me, I will always associate Doctor Who with the Thanksgiving holiday. I am probably not the only fan who feels this way but, that’s another story….. I really appreciate your blog. I watched Doctor Who religously in the early 80s. Lately, I've been trying to fit the whole thing in a sort of time frame (for whatever reason) in my head. I remember the episodes were shown on weekdays and then it switched to the movie format on the weekends. You helped get a clearer understanding of when the change took place.